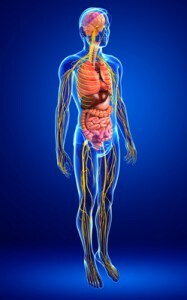 Visceral Manipulation is based on osteopathic principles and focuses on locating and resolving abnormal tension (s) of connective tissue that can link the organs of the body to various tightnesses in the musculoskeletal system. When there are abnormal tensions in these connective tissues, it can effect the physiological functioning of an organ as well as the structural integrity of the body. Correcting these imbalances can alleviate chronic irritation and stress, which may be responsible for disease or pain in the body.